The River Ganga at Gangotri in Uttarakhand state in the Himalayas. Credit: Sujoy Dhar/IPS. UNITED NATIONS, May 11 2016 (IPS) - Jake Norton was on a glacier in northern India. A seemingly impenetrable fortress of sweeping ridges and towering walls of granite, capped by hanging glaciers. It seemed, he said, that nothing could touch it, nothing could beat it down. 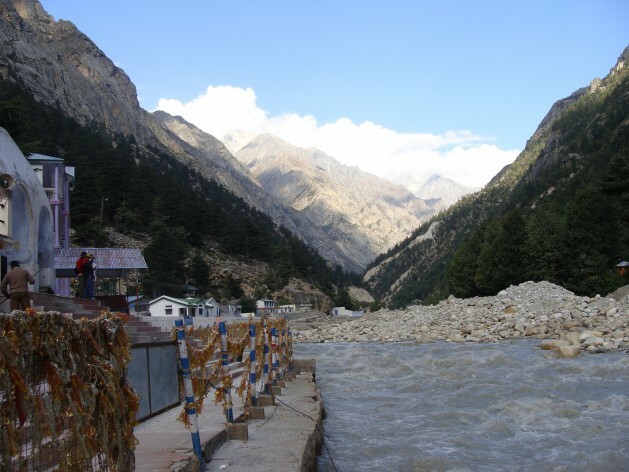 But then he heard a dripping sound at 18,000 feet, there on the Gangotri glacier, the headwaters of the Ganges river, arguably the most sacred river in the world, the very lifeblood – spiritually and physically – of 500 million people living downstream. The Ganges was flowing from above the glacier. An area which should be a realm of ice and snow, was now a place of melting rain and disintegrating glaciers, recalled Norton, the Mountain Partnership Ambassador and an intrepid climber who is known for conquering Mount Everest three times. In this ecological mayhem, the ones who often suffer the most are the world’s most marginalized people, those who live among the towering peaks and sweeping valleys. According to a Food and Agriculture Organization (FAO) report, “Mapping the vulnerability of mountain peoples to food insecurity,” the average number of people suffering from chronic hunger in developing countries is one out of eight, but among the mountain people of developing countries, it is one out of three. During the years 2000 to 2012, while food insecurity decreased at the global level, there was an alarming 30 percent increase in the number of mountain people in developing countries who vulnerable to food insecurity. The developing world’s mountain people number 915 million, making up 13 percent of the global population and the mountain areas they live in make up a quarter of world’s surface. With these new findings, the FAO launched the Mountain Facility initiative here last Friday, a funding mechanism to support governments and NGOs in addressing food insecurity in mountainous regions. Thomas Gass, an Assistant Secretary-General in the UN’s Department of Economic and Social Affairs (DESA) asserted that the interests of the mountain people is being promoted. To meet this challenge, Mountain Facility has come up with five targets: developing local economies, climate change adaptation, natural resource management, policy making and capacity building. Thomas Hofer, Coordinator of the Mountain Partnership Secretariat, stressed the need to promote products made in mountains and help the mountain production process. “Promoting mountain specific products could give the people living in mountainous areas more voice in the nation,” he told IPS.